Denis Shapovalov had high hopes heading into this year's Rogers Cup. He wanted to hear the cheers from the hometown crowd. He wanted to entertain his fans on centre court. And he wanted to build on the success he enjoyed at last year's tournament in Montreal, where he broke onto the tennis scene with huge upset wins over top-ranked opponents. The Canadian teenager fell short of that last goal Thursday night, falling 7-5, 6-2 in a quick and uncharacteristic third-round loss to Robin Haase of the Netherlands. "First of all, I just want to thank the fans for coming out tonight and this week. They've been a huge part of my success before and a huge part of my success this week," said a dejected Shapovalov, tucking his long blonde hair behind his ears while addressing media in a post-match press conference. "And obviously, you know, I'm sorry I kind of disappointed them today ... I wasn't able to perform my best." Shapovalov, the highest-ranked Canadian in the men's singles draw at No. 26, had trouble with his serve throughout the match on centre court, which lasted just one hour 16 minutes. He was broken four times and had six double faults, including four in the first set. Shapovalov said Haase played him "smart," forcing a change in his usually much quicker pace. The substantial breeze that whipped through the air, cooling down the mild August night, didn't help things either. "It was pretty windy, so it was tough for me to get behind the balls and play aggressive today," Shapovalov said. "[Haase] played smart in that way. ... He's got a lot of experience. He's been playing unbelievable." Two breaks in the first set put Shapovalov down 6-5 — with the young star hitting a shot into the net to give Haase the winning point. The 31-year-old easily held serve for the 7-5 win to hand Shapovalov his first dropped set of the tournament. Haase carried that momentum into the second set, breaking Shapovalov twice for an early 4-1 lead, and the teenager couldn't recover from there. "Unfortunately I had a bit of an off day and those things happen," Shapovalov said. "But yeah, it's been a really good week. I'm really happy with the way it turned out. I really feel like I've found my game from a couple months ago. "And I'm playing really well — you know, except for today." Shapovalov was the last Canadian standing on the men's side of the tournament after Milos Raonic and Peter Polansky, both from Thornhill, Ont., and Montreal teenager Felix Auger-Aliassime lost second-round matches Wednesday. Toronto's Daniel Nestor, competing in his 30th and final Rogers Cup before retiring next month, also lost his first-round doubles match Wednesday night with Vancouver's Vasek Pospisil. Shapovalov walked out to centre court before the Thursday night match to a loud ovation, and received another hearty applause when he was introduced during warm-up. The product of nearby Richmond Hill, Ont. — roughly a 20-minute drive to the north end Toronto stadium on the York University campus — raised his racquet to acknowledge the crowd. "Even today with the crowd support, it was helping me kind of trying to stay in the match and keep fighting," he said. "So I really appreciate that." The match was the second career meeting between Shapovalov and Haase. The Canadian got the better of his Dutch opponent the first time, beating him in straight sets a Masters 1000 event in Rome earlier this season. Haase had an easier path than expected into the third round when third-seeded Juan Martin del Potro of Argentina withdrew from the tournament with a wrist injury before their second-round matchup Wednesday. Haase instead faced Russian Mikhail Youzny, who replaced del Potro as a lucky loser. Shapovalov and Haase were both semifinalists at the Rogers Cup last summer, when Shapovalov lost to eventual champion Alexander Zverev and Haase fell to Roger Federer. Then ranked No. 143, Shapovalov burst onto the scene with a stellar performance at the Montreal tournament that included wins over del Potro and Rafael Nadal. He continued his success a month later, reaching the Round of 16 at the U.S. Open. 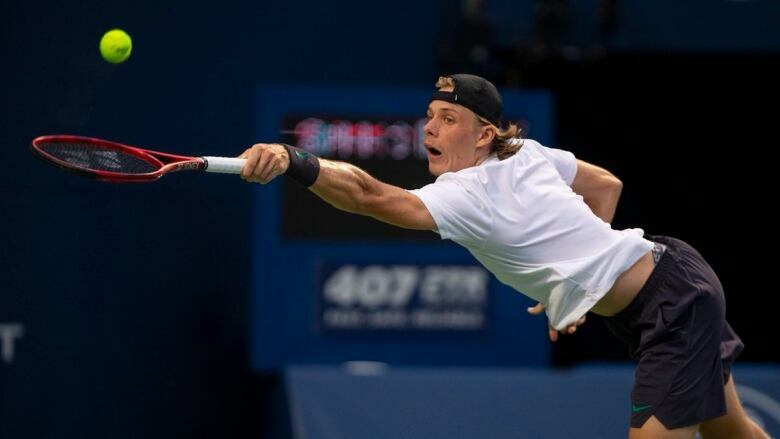 Playing at home for the first time since that remarkable run — he reached the top 50 by the end of the year — Shapovalov said he "didn't feel any pressure whatsoever" in front of the Canadian crowd. "I was really happy and excited to be out there," he said. "It just didn't turn out as I wanted it to today." In the other late matches, top-seeded Rafael Nadal of Spain beat Swiss wild-card entry Stan Wawrinka 7-5, 7-6 (4) and eighth-seeded American John Isner was upset by Russia's Karen Khachanov 7-6 (5), 7-6 (0). While earlier in the day, Greek teenager Stefanos Tsitsipas ​upset Novak Djokovic 6-3, 6-7 (5), 6-3 in a thrilling battle between one of the Tour's top young guns and the reigning Wimbledon champion. The 19-year-old Tsitsipas broke the ninth-seeded Serb early in the third set and held serve from there to reach his first career Masters 1000 quarter-final. "I was waiting and I grabbed him like a bulldog and I stuck there," Tsitsipas said. "I executed my plan, I knew at some point that he was going to break. I just patiently waited for the moment and it happened." Tsitsipas raised his arms and tossed his racket in the air after sealing the win. He'll next face second-seeded defending champion Alexander Zverev of Germany, a 6-3, 6-2 winner over Russia's Daniil Medvedev.